On the afternoon of Friday, May 31, 2013, at 4:59 p.m. EDT, the nearly two-mile-wide asteroid 1998 QE2 will pass by our planet at a distance of about 5.86 million km (3.64 million miles)… about 15 times the distance between Earth and the Moon. And although it poses no threat of impacting Earth neither during this pass nor in the foreseeable future, on the eve of its close approach NASA revealed a surprising discovery about this cosmic visitor: it has a little moon of its very own! 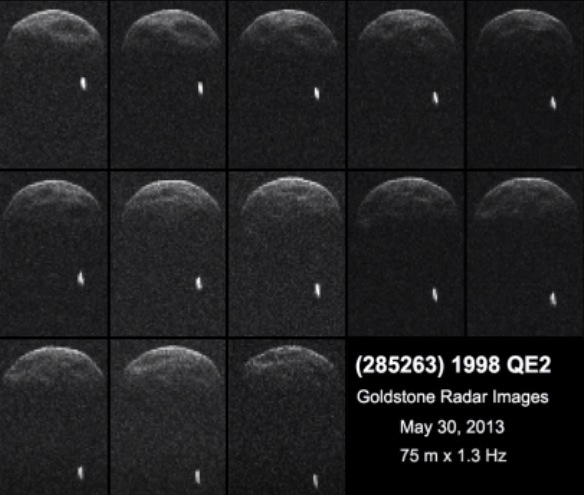 Made evident in recent radar observations from NASA’s Deep Space Network’s Goldstone facility, asteroid 1998 QE2’s moon appears to be about 600 meters (2000 feet) across. As the binary pair passes, further radar observations will be made to determine more details about the size, shape, and motion of both objects. According to specialists at NASA JPL, about 16 percent of asteroids are known to be double- or even triple-object systems. See an animation of 1998 QE2 and its satellite, along with information on how and where to view their pass, here. ADDED 5/31: What would happen IF 1998 QE2 were to impact Earth? The Feb. 15, 2013 Chelyabinsk superbolide was caused by an object only about 50 feet wide. 1998 QE2 is an estimated 1.7 miles across. There are a lot of factors that determine the effects of an impact. Asteroid speed, composition, angle of entry, where it hits and what sort of surface material it comes int contact with… all of these things affect what happens during atmospheric entry and, when and if it happens, impact. Many objects break apart completely before they even get near the ground — like the Chelyabinsk meteor or the Tunguska impactor — but the air blast can still cause considerable damage. But since 1998 QE2 is a decently large-sized asteroid, it would likely survive passage through the atmosphere and hit the ground (or ocean). Using Purdue University’s Impact: Earth! online app, I plugged in some parameters to see what the effects would be if the asteroid that’s passing us today were actually to hit us. The results? Well, while not planet-destroying by any means, certainly not good for anyone or anything in the vicinity! Game over — in less than 2 seconds you’d be engulfed in a fireball for over 6 minutes. Crater ejecta fragments 100 feet wide would be raining down on you. And in less than a minute, an airblast of wind over 10,000 mph and 4670 psi would scour the area, demolishing buildings, bridges, and trees. The resulting seismic shaking, equivalent to an 8.5-magnitude earthquake, would crumble buildings and dams, break pipes, and bend railroad tracks. Still bad: heat from a fireball 37 times larger than the Sun sets trees, grass, wooden buildings, and clothing on fire. 8 minutes after impact a 625 mph airblast knocks over buildings, bridges, and trees, and fragments up to a foot across fall from the sky along with a continuous rain of dust. You’d see a bright fireball 4 times larger than the Sun on the horizon. The seismic rumbling of the distant 8.5-magnitude quake would be felt by many, similar to a large truck passing by your house. The airblast would come 25 minutes after impact, shattering windows and knocking down some trees and tree branches. A coating of dust would fall over the area. The fireball would be below the horizon, but an hour and a half after impact you’d feel a 20 mph wind gust — a subtle reminder of the devastation experienced earlier at the site of impact, which would certainly have long since taken over all news and media. The total energy of the impact would be equivalent to 694,000 megatons of TNT. The final impact crater would be 18 miles wide and over half a mile deep. Purdue University’s Impact: Earth! allows you to calculate the effects of any type of asteroid impact. Click to try it yourself! Luckily, QE2 is safely 3.7 million miles away and shows no sign of sharing the same space as Earth in the foreseeable future. But there are a lot more objects out there like it (and unlike it) so while not a cause in itself to be alarmed, this close pass is yet another reminder that we should invest the time, technology, and resources in identifying as many asteroids as we possibly can — before it’s too late. See more here on NASA JPL’s Near-Earth Object database and on the B612 Foundation’s Sentinel mission page, and calculate your own bad day effects on Impact: Earth! Next Post You Will Love This Animated Space Adventure. I JUST FOUND YOU’INS AND I AM THROUGHLY IMPRESSED, KEEP UP THE GOOD JOB AND I’LL BE HERE TILL I.M GONE! THANKS FOR ASKING.